The fifth season of HBO’s Game of Thrones released to Digital HD last September, and even included some bonus features such as as “A Day in the Life,” “Season Five: Poisons of Westeros,” and the 23-minute “Season 5: The Great Pit Fight of Dasnak.” But for those of you who still enjoy packaged media and want every bit of bonus content available from Game of Thrones, the Blu-ray Disc edition contains much more. Along with all ten episodes from Season 5, the Blu-ray edition includes 4 highly-anticipated deleted scenes and additional unreleased extras not available with the digital purchase. 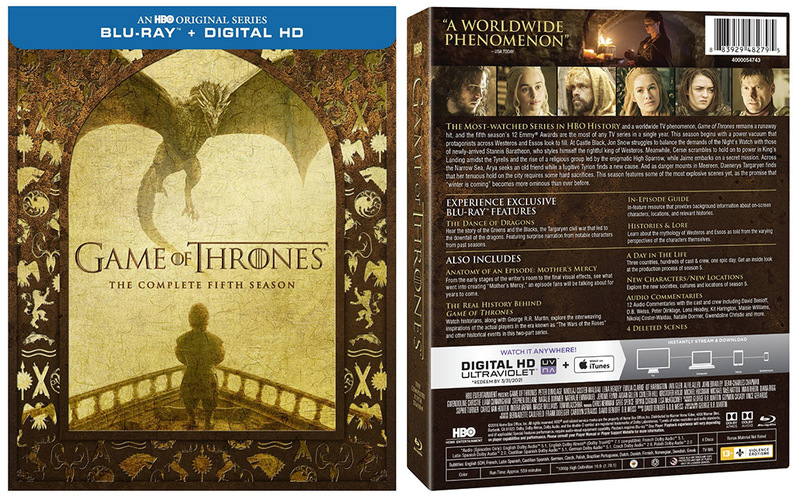 Game of Thrones: The Complete Fifth Season includes the exclusive Blu-ray feature “The Dance of the Dragons” that provides a history of the Targaryen civil narrated by the show’s characters. Theres also an “In-Episode Guide” with background information on the season, and a “Histories & Lore” component.